We’ve got an awesome news for you! We did it! They will update our kernel! We can thank them after they will actually release the update. just give us the signal boss we’ll thank them later. i think now we can because WE DID IT!!! 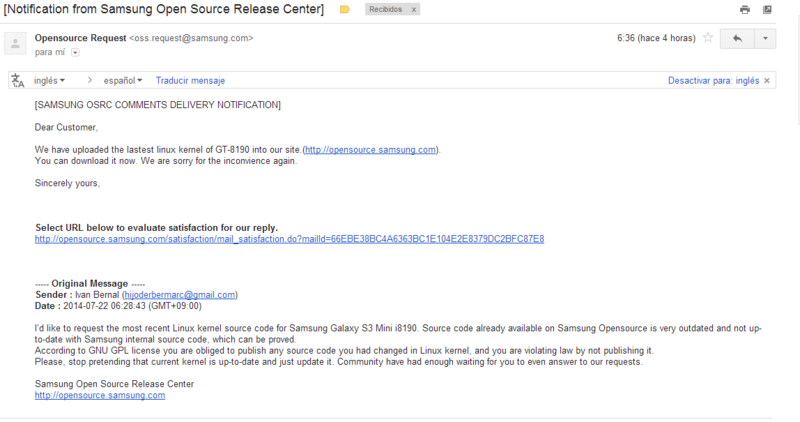 I get reply from Samsung but they wrote to me they put newest opensource kernel, but there’s no date release on files. Could they piss on it, and try cheat us? Good news but I’m far from being so enthusiastic. “We are now planning” means …nothing special when there is no date specified. Thank you for the great initiative, M & M! Awesome …. Great news .. Really proud of our great community… Thank to Samsung considering our request . We have a great leaders Mr. M&M. Does it mean something for NFC in I8190N? The missing NFC drivers wouldn’t be open source, so they don’t have to provide them. Marcin can you tell us some more about what you are planning to change in the kernel? is it possible, now that you have the latest kernel source code, to enable overclocking for the Samsung Galaxy S3 mini GT-I8190 ??? Nice! A big thanks to you guys! How about NFC? Is there a chance to get it running with a new kernel? I got the same message as well. I wondered why they said “Hello, Customer” even though they had our names. Just got the same email and came here to post it! Great news! We are all happy for our little victory, but then it rises a question – When they’ll release the update ?! thanks to novafusion team. I wasnt think about respond will come quickly. How many weeks we need to wait for this source ? Habra algun cambio para los sensores de luz y proximidad en los modelos I8190N? Y podremos usar el NFC ? Which version will that be? Awesome ! Does it means capacitive buttons will work ? Please tell us we are few users with this problem but maybe one of the most anoying…. That’s right. I count on it too. Unfortunately my phone is also affected. Congratulations!! Very good notice, this update will work for the S advance? Or we have to do the same thing to get it? I got the same message 🙂 Thanks Novafusion!! Lol… my oneplus one just arrived yesterday. No more buggy samsung sh*t!!!! i wish all of you s3 mini owners a lot of fun with your devices and macs roms. what would i have done without you maclaw? 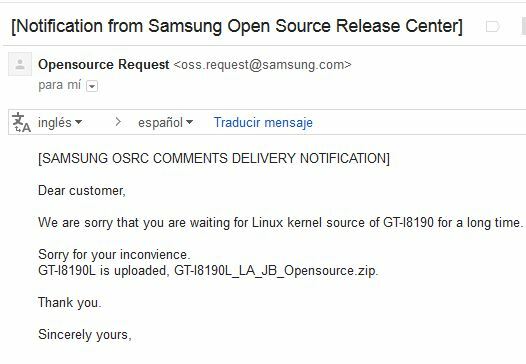 Entonses la siguiente room la sacarán hasta que samsung libere el odio del kernel o sacarán más room antes de eso? Seguro sacaran más ROMs antes de eso. El problema es que seguramente Samsung tardará un montón hasta que libere el código. Y todavía no entendí que versión de Kernel será. ill continue spaming till you get the actual kernel in your hands xD °,.,° ahhh maclaw so if we get the kernel are we going to se an kitkat AOSP and the normal CM releases without bugs or maybe a final release of it? and the new kernel (i know that isnt release yet but….) will it be compatible with android L? GREAT news …. thanks to you all Novafusion team… Banjay !!! THEY UPLOADED IT!!! NEW SOURCES ARE THERE!!!! the kernel was uploaded !!!!!!!!! I just received the uploaed Kernell Email. Very Nice. Me too got kernel update email. Should i reply that email [with thanks]??? 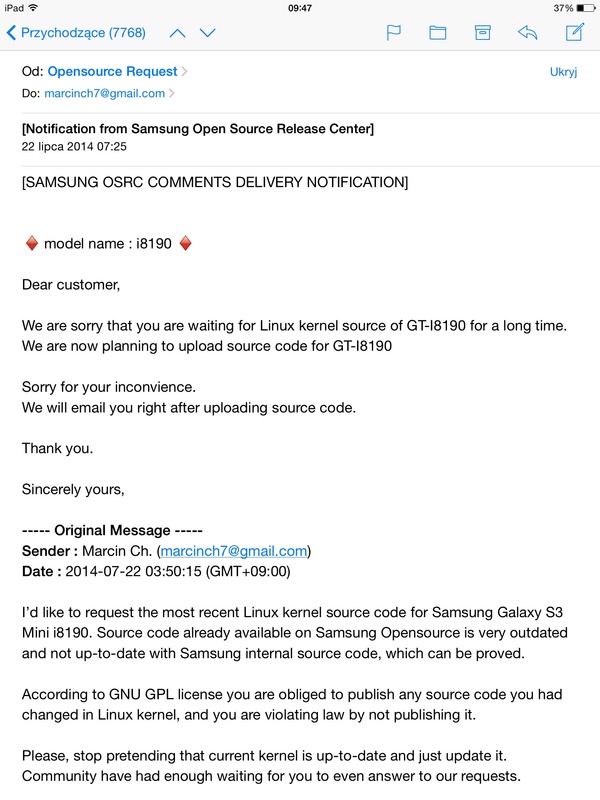 We have uploaded the lastest linux kernel of GT-I8190L_LA into our site(http://opensource.samsung.com). como se el kernel correcto que tengo que descargar me lo explica equipo Nova por favor. as actualizado Kernel? como lo hago por favor. Just wait for a new release, will include the new kernel. Espera a la actualizacion de hoy, el kernel nuevo ya podria estar incluido. ya lo e pensado pensaba que podría instalarlo yo….gracias. When i send the request for new kernel, i made it for my model i8190L. I just received the uploaed Kernell Email, then i went to check the link they send to me, and there it is, they upload the kernel. So whats next, what novelties we will see? As mentioned above, does the kernel help with NFC? We’d like it even if the driver would be closed source as opposed to everything else.. please? I’ve got another email! They’ve uploaded the kernel! It says jbupdate2. Is that a new kernel? Ok alright. i hope we get the new kernel. Off-topic question: How many unread emails do you have?